Could public bike sharing work in Jaipur? Photo by Carlos Heredia. Public bicycle sharing (PBS) is an innovative platform comprising short-term bicycle rental schemes in which bicycles can be picked up at any self-serve bicycle station and returned to any other bicycle station. These bicycles are best used for shorter trips, to fulfill “first- or last-mile connectivity” and to fill gaps that may be considered too far to walk between public transport facilities. The bicycle is a clean and sustainable mode of transportation. Additionally, bicycles enhance city landscape and public land use due to their minimal parking space requirements. 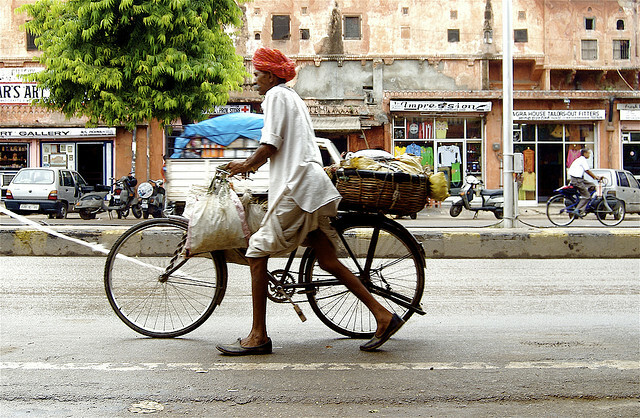 With 7 percent of the city’s modal share in cycling, Jaipur’s cycling culture provides many opportunities to implement PBS, especially in the walled city, at the heart of Jaipur. Its historic monuments like Hawa Mahal, City Palace and the abundance of shops attract close to half a million tourists annually. There are also many schools and colleges in the area providing favorable conditions for bicycle sharing stations. Recognizing its potential, we propose the launch of a pilot PBS project to fill this need. In the walled city area there are 84 cycle shops that informally rent bicycles to the public. For instance, the customer is required to return the cycle to the shop where it was hired at the end of the trip. These shops are operated under the Jaipur Taxi Cycle Owners Association, which regulates the rental rates of all bicycle shops registered under it. These rental shops are located throughout the walled city, though many are clustered at Ghat Gate and Ram Ganj Bazaar, where the shops are located on the main road. At other places, the location of the shops is in the narrow lanes connecting the interior residential areas to the main market streets. According to our research, the majority of users are laborers, hawkers, factory workers, painters, masons and individuals using cycles to perform their errands or sell goods in the market. Despite the popularity of sharing bicycles, there is no system of security deposits to guard against theft, and cycles are only rented to acquaintances. Shops rent ordinary cycles for about Rs 4,000-4,500 (US$72.20-US$81.23), with maintenance costs, including labor, at about Rs 250 (US$4.51) per day. The operating and maintenance costs vary with the number of cycles held, with a lower per unit cost as the scale of operations increases. According to our findings, cycle rental on a standalone basis is not viable. Owners have certain allied business that make their operation possible. Shops are often involved in cycle repair, and the sale of new cycles and spare parts. We observed that as the number of bicycles decreased in a shop, the services provided by the shop changed. Shopkeepers have started retailing food and other items. For some, renting bicycles has become a secondary business. The renting of bicycles seems to be financially unviable as a standalone venture, but it becomes viable with allied activities. Some shops have even switched to other sectors, such as selling food. On the other hand, it is evident that the demand for a public bicycle scheme is there for tourists, especially foreigners, who are well-versed with the concept of PBS. Once a PBS system is up and running, the walled city will attract heavier patronage and will be a stepping stone for a full-scale system spread across the entire city. WANTED: Bike Share in New York City!